The holiday season is quickly approaching. An outdoor holiday party is a great way to change up the traditional holiday atmosphere. Hosting a holiday party year after year can begin to get monotonous. Why not get creative and invite your guests to an outdoor holiday party they will never forget? Here are some tips and tricks for creating an elaborate and unforgettable festive holiday event. Even if you live in a warmer climate the winter months can get a bit chilly. Keeping your guests comfortable is important for everyone to enjoy an outdoor holiday party. Outdoor heaters are a great way to keep toasty even if the weather is not forgiving. Stand up outdoor heaters can be purchased for as little as $120 or if you are hosting a one time event renting might be more cost effective. Another option is to purchase small space heaters. Place them around your sitting area to keep your guests’ feet cozy and warm. Baskets of blankets are another great addition to keep everyone cuddled up. Each guest can receive a blanket at their seat or grab one from a decorative basket to wrap around them if things get too chilly. Lighting sets the mood for any great event. 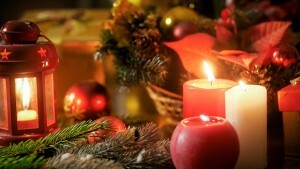 Candles are a great way to add an element of warmth and holiday delight to your outdoor decor. Placing an abundance of tea lights at your holiday table can create a comfortable ambiance. Fairy lights placed around your outdoor space is another great way to add a subtle glow to your outdoor space. If you are feeling extra festive colored lights are a fun way to add a bit more celebration. Enjoying a festive holiday drink is a fun part of the holiday party experience. Setting up a self-serve holiday bar can help you stay hands-free from cocktail service. Adding 2 or 3 easy to make holiday drinks with step-by-step instructions and a beverage menu is fun and festive. Even a festive holiday punch prepared ahead of time is a great option. Make sure if children are in attendance, you clearly separate the adult drink table from the children’s beverage options. Having a kids beverage table with stickers to decorate cups or juice boxes is a cute way to keep the kids having fun too. A great way to say thank you to your guests for attending your outdoor holiday party is to send them home with a festive grab bag. Ornaments or a cute pair of cozy mittens are a great way to say thank you for attending and come again next year. This small token of your appreciation does not need to be elaborate. Sometimes the little things make big holiday events more memorable. However you choose to spend your holidays, being with friends and loved ones is the real gift. Remember there is fun in the planning too. Get creative with your soiree and put your own personality into your event. An outdoor holiday party is a great way to make the season one to remember.